During a ten-day, silent Metta retreat in Taos, New Mexico I personally experienced a vision that broke into my consciousness in the middle of deep meditation. While fully aware and centered, I perceived what I knew to be the Web of Life. I saw clearly with my inner eye that the people in the room meditating with me were all points of light on a grid made up of light beams. I speak of this as a vision, but it was no fantasy. I could see the web and feel the emotions of one individual point of ‘light’ on whom I focused my attention. It became clear to me as I expanded my consciousness outside of the meditation hall and into the world beyond that not only were we meditators connected on this web, but that all human beings everywhere and everything in the universe is connected. During our sharing on the last day of the retreat, the person I’d ‘beamed’ in on expressed his overall gratitude for the retreat and the sadness that brought him to Taos for healing in the first place; exactly how I’d perceived his feelings in my vision. However, most scientists today are not proponents of non-local interconnectivity as evidenced by their current ridicule of Sheldrake for his belief—backed by myriad accounts and anecdotal data over time—that “telepathy is normal not paranormal, natural not supernatural, and is also common between people, especially people who know each other well.” Be that as it may, I’ve learned through my own experience of paying attention, witnessing, and contemplating the symbols and archetypes that present themselves in meaningful coincidences, dreams, and visions that we are ‘wired’ with inner sight and connected to others in ways that defy the ‘laws’ of cause and effect. Jenna’s dream (in part): I was late to the wedding because I had spent so much time looking for the exact ‘fancy’ jacket. (Does anyone hear a book reference here?). When I get there, it is is not the wedding I expect being performed, but another ceremony uniting a man and woman of color that I don’t know. There is a ritual of sorts being performed with this couple that I become interested in: as the vows are being spoken, a priest/shaman turns the couple in different directions to receive their blessings. I ask my mother-n-law, whom I’m sitting next to on the floor because there are no seats left when I arrive, where our family wedding people are? She answers, that B, my sister-in-law, has decided to rewrite her vows and it will take awhile before that ‘show gets on the road.” (Does anyone hear another book reference?). Serene’s dream (in part): After she and I have exhausted our search, we decide to wear our ‘normal’ clothes and head for the wedding. In the same building in which the wedding is being performed, we stop in at the library to check out some books (a blatant book reference!). While Serene is trying to pick out her book, a few rowdy boys try to push her out of the way, but she gets her book, checks it out, and go to the wedding. Because of experiences like this, I know that we—Serene and I and others—are connected by invisible threads, or strands of light on a web, if you will, and that our experiences when we are open to them, often reflect that connectedness. This dream/synchronicity also illustrates why it’s so important to share dreams in family and group settings. Thank you, my darling six-year old granddaughter for helping me to see that my book project is being stalled by fear of not measuring up to others expectations. We don’t have to be the most the ‘fancy’ dressers for the Wedding to take place. We can both (Serene has a perfectionist bent, too) ignore those ruffian perfectionists in our unconscious psyches and claim what is ours with impunity. 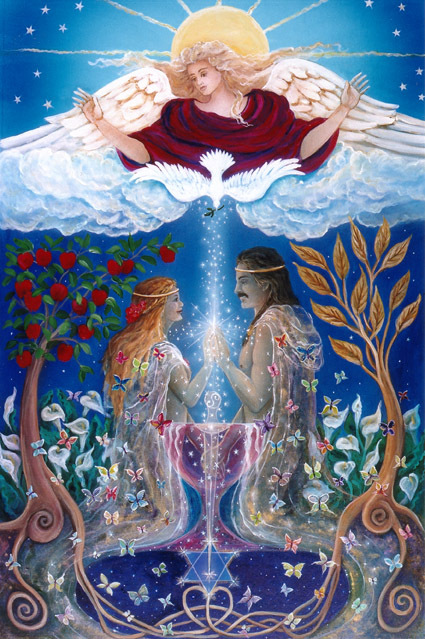 The Bride and Groom are eager for the ceremony that will bless them and us in turn by bringing together the creative and manifesting forces that are longing to be united. Love this experience with your granddaughter! Your synchronous dreams with Serena are a knock-out. These experiences prove the mythological view and the view found by many scientists (including Vic, physicist and lover of synchronicity who had synchronicity experiences right to the end). Thank you, Jenna. I look forward to your book. Thank you, Synchronicity Sister! If I weren’t a believer in the Web of Life before, I would be after making connections with you, Jean Raffa, Patti and others whose vibrant energies have reached out across the CyberWeb and pulled me in. I am just beginning to learn that Myth is often more real than our daytime ‘reality’ on many levels. Our little Serene…a lover of myth and fairy tale since she was a wee lass of three…was lucky to born at this time in Herstory when the Goddess is re-emerging in all Her glory. Thank you for all your support and wise words. How wonderful is the internet! Yes, the Sarasota Jung society is one of my favorite places, and you and Jenna are two of my favorite internet friends/contacts! Any word yet on when your book will come out? I can’t wait! And now, Jenna has a book project too. Who knows, perhaps Larson will publish hers as well. I wouldn’t be surprised the way the synchronicities just keep coming! Big Hugs, all around, ladies! Jeanie, I’m thrilled that Anne Baring and you have become acquainted and that I had some small hand in that. I just love these connections we’ve built on the Internet. I’m sorry I will be missing your talk in Sarasota. However, I will be in Florida – Tampa Bay to visit family and friends – from April 11-28th, and would love it if you and I could meet, even for a cup of tea during the time I’m there. I am so fortunate to have you and Elaine in my book-writing cheering corner! I would be ecstatic if Larson were to publish my book, now that you mention it. I will have the book completed by this fall and will send a query.